One Central London Crossrail station, that doesn’t seem to make the headlines is Farringdon station. This article on bdonline.co.uk is entitled Crossrail prompts Farringdon makeover plans, brought the station into my mind. Like some other Crossrail stations, Farringdon is a long double-ended station, stretching almost from Barbican station to the current Farringdon station, where Thameslink and the Sub-Surface Lines cross. Wikipedia says this about Crossrail development at the station. The Farringdon Crossrail station is being built between Farringdon and Barbican Underground stations and it will have interchanges with both of them. Access at the Farringdon end will be via the new Thameslink ticket hall. Work is anticipated to be completed in 2018. Crossrail will link Farringdon to London City Airport and London Heathrow Airport, the Olympic Park in Stratford, Canary Wharf, Bond Street and Oxford Street, and Maidenhead in the west and Shenfield in the east. The station will also be a hub for cross-London travel, being the only station to be on both the north-south Thameslink service and the east-west Crossrail service. 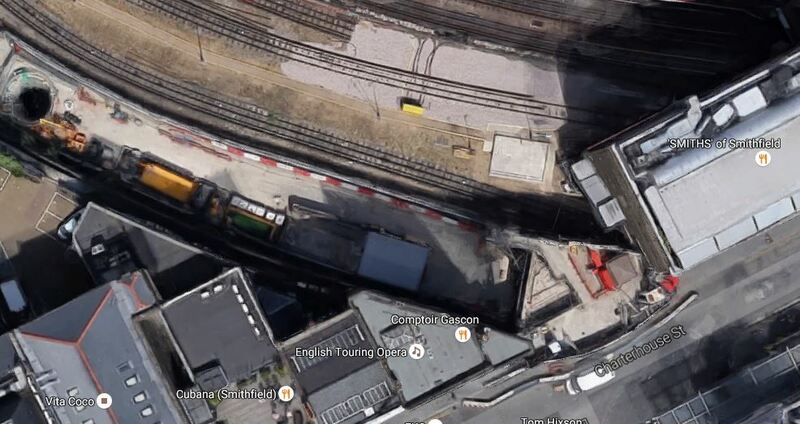 There would appear to be station entrances in Long Lane at the Barbican end and Cowcross Street at the Farringdon end, according to this page on the City of London web site, which contains these details of Farringdon station. The station will include two ticket halls. The eastern hall will be located within the City at Lindsey Street and the western hall (shared with Thameslink, and which opened in December 2011) is be located at Cowcross Street in the London Borough of Islington. 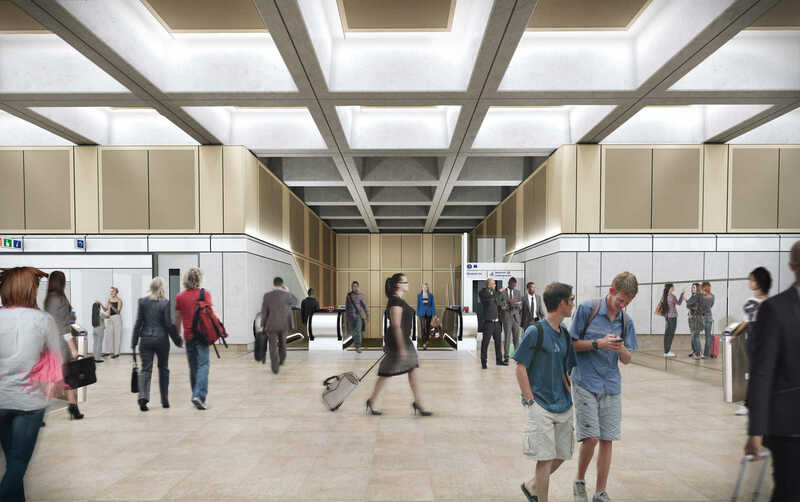 The eastern ticket hall will also provide a second entrance to London Underground’s Barbican station. The entrance to the eastern ticket hall will be via a double height space, occupying most of the frontage on Long Lane and part of the frontage on Lindsey Street. The remaining frontage will be formed by future over-site development. Part of the frontage is also required for the discharge of Smithfield Market car park ventilation and escape stair. Access to the platforms will be by means of escalators and there will be a number of lifts to provide step-free access to the Crossrail platforms and the London Underground platforms at Barbican station. 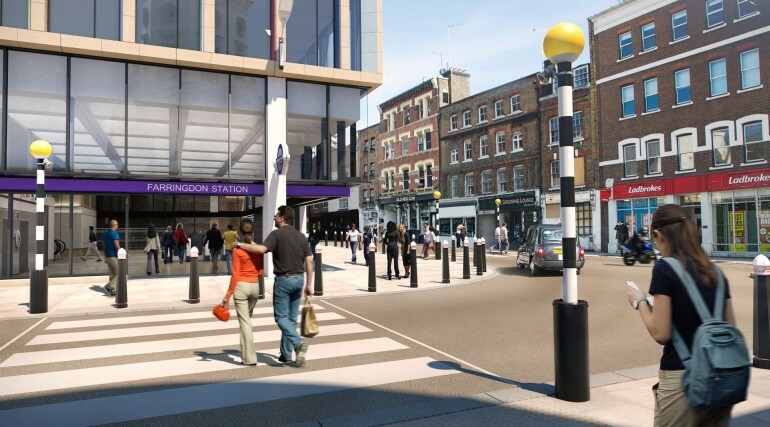 Preliminary discussions have commenced with Crossrail about the need for complementary measures such as improved crossing facilities and streetscape improvements to handle the projected increase in pedestrians in this area when the station opens. 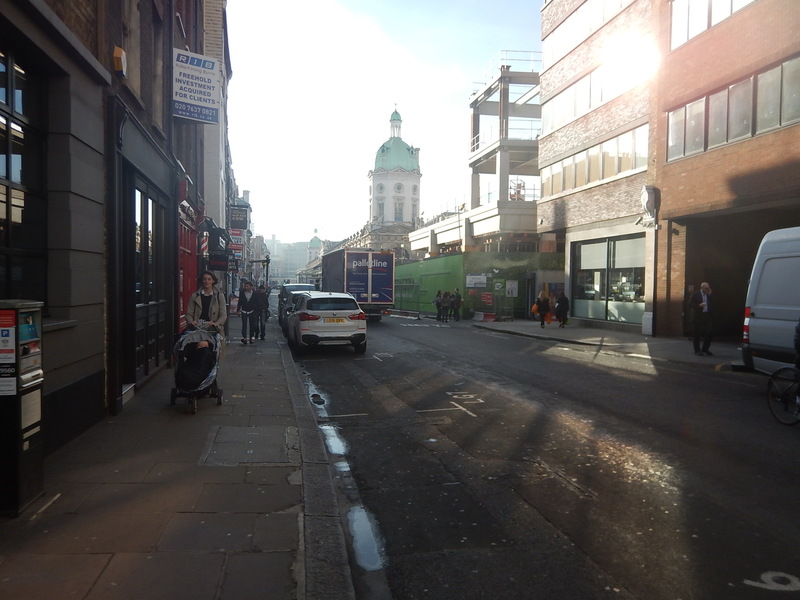 Crossrail have been advised that the over-site development will have to complement the settings of the listed market buildings and the Smithfield Conservation Area. It is interesting to look at this map of the rail lines through Farringdon from carto.metro.free.fr. Note how the two Crossrail tracks appear to move apart through the area. It will certainly allow lots of escalators at each end of the Crossrail platforms. Crossrail platforms are long, to accept the Class 345 trains, which are two hundred metres long. But this article on the Crossrail web site, which is entitled Current Works At Farringdon Station, contains this paragraph. A new ticket hall is being constructed at the eastern end adjacent to the London Underground Barbican Station. It is linked to the Cowcross Street Ticket Hall by two platform tunnels which are among the longest on the route at 350 metres, more than double the length of the Hammersmith and City line platforms. As the crow-flies distance between the two Sub-Surface Line stations is around 500-600 metres, these are seriously long platforms. Obviously, this length of 350 metres is deliberate, but why? I can think of the following reasons. Longer platforms might be needed to connect to the two ticket halls. Because the platforms appear to curve apart, they would need to be longer. Passenger access to the various walkways, escalators and lifts, might be better. There could be some safety reason. Two trains could both be partly in the Farringdon platforms at one time, to perhaps transfer passengers from a stalled train. But whatever the reason, it could be a long walk,, if you get in the wrong end of a train for the exit at your destination. Early on a Sunday morning, I walked between Barbican and Farringdon staions. I’ll split comments into sections.. Note the following about Barbican station. It has some excellent brick walls enclosing the station. The station was unsympathetically remodelled by the Nazis. You can still see the remains of a steel and glass roof , that was removed in the 1950s. There will be an entrance to the Barbican end of the Crossrail station at Farringdon from the Western End of the central platform. My thoughts on Barbican station. When as a family we lived in the Barbican, we used this station extensively and I suspect that the humble entrance to and from the station will be heavily used by Crossrail passengers. If the central island platform proves to be too narrow for a walking route, it could always be widened, by using some of the space, where the trains used to run to Moorgate. Will an entrance be built on the other platform to Crossrail, so that passengers going East on the Sub-Surface Lines will have an easy step-free interchange with Crossrail? On a personal travel point, Barbican might be my entrance to Crossrail/Thameslink, as I’d just take a 56 bus from round the corner from where I live. 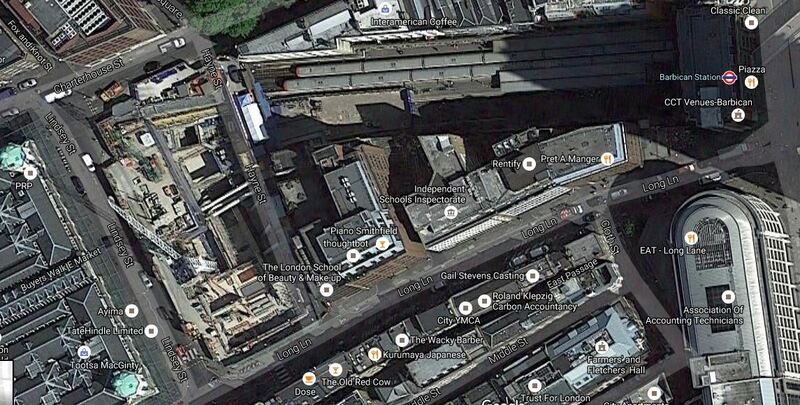 This Google Map shows Barbican station and the building that will contain the Long Lane entrance to Farringdon Crossrail station. This map is a very informative one. You can actually see behind the hoardings on the platform at Barbican station. There are two trains in the station. There is a gap in the buildings on the South Side of the station along Long Lane, that I labelled a development opportunity in the gallery. 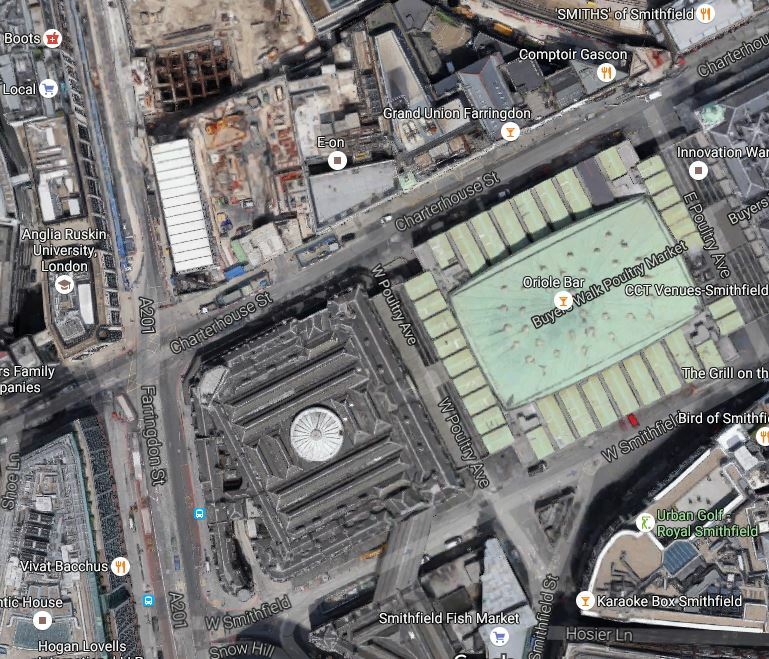 You can see the two domes on the Eastern end of Smithfield Market. 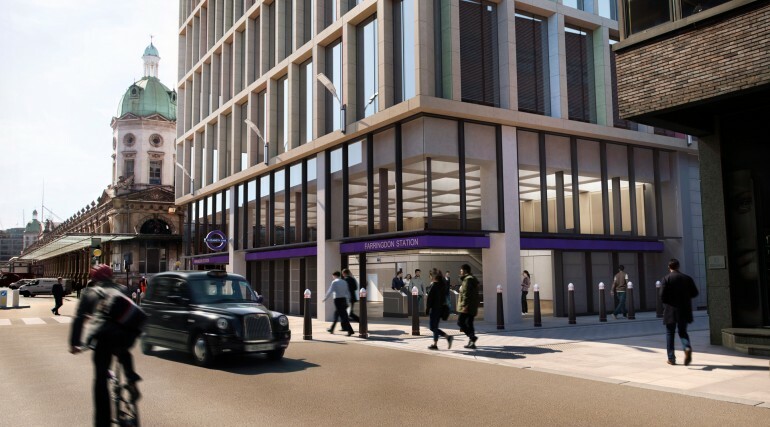 This image shows how the Long Lane entrance to Farringdon Crossrail station and Barbican station, will end up being treated as one station by travellers. 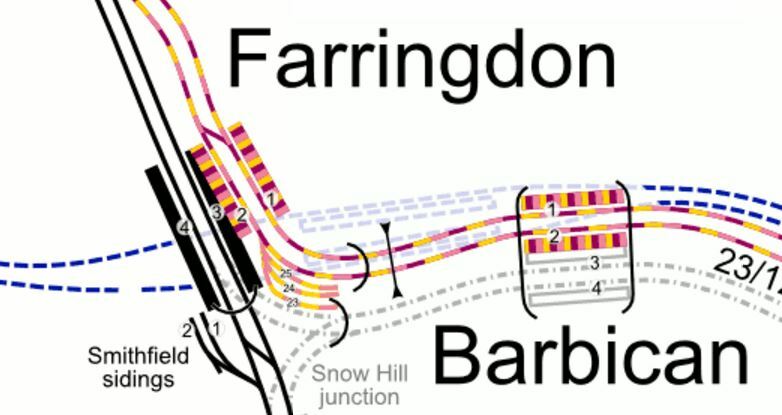 This is an image from the Farringdon station page on the Crossrail web site. And this is my picture taken on my walk. I think that the angles are similar, but I probably needed to stand further out. 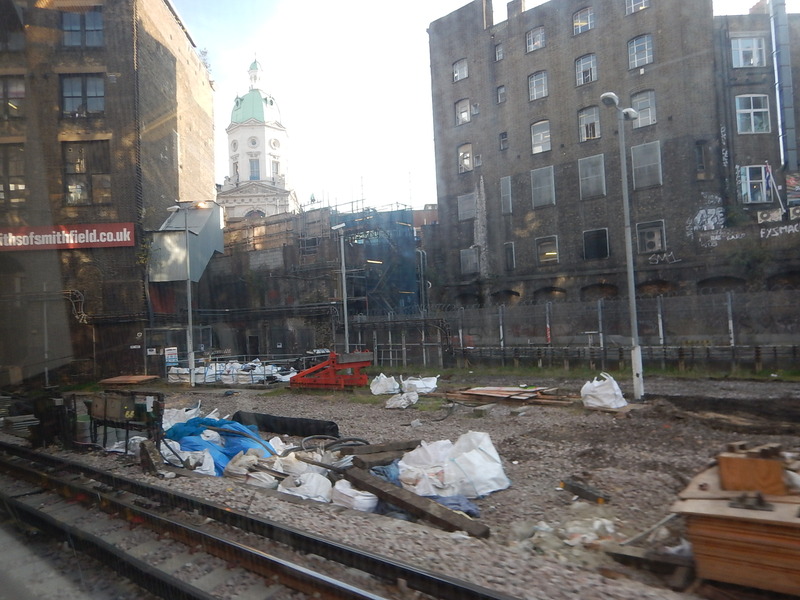 This second image from the Crossrail web site, shows the view from just round the corner. This is the nearest picture I have. Note the zebra crossing, which appears on both images. 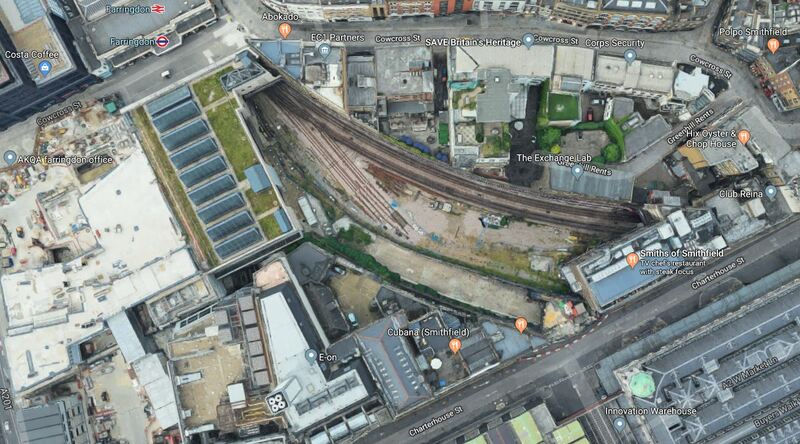 This Google Map shows the Cowcross Street site in relation to the current station. The site with the obvious hole and what looks to be a large grating is where the Cowcross Street entrance is being built. If you go into the Thameslink Ticket Hall and look to your right, you’ll see that the wall is not of the highest quality. 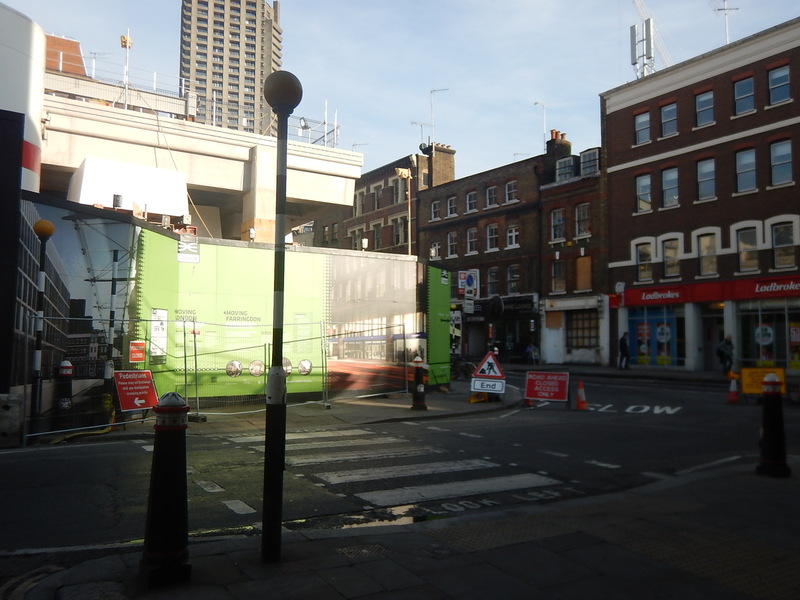 It could be just temporary, until the Crossrail station is built. Between Comptoir Gascon and Smiths of Smithfield, is a small Crossrail site, which is shown in the gallery. Is it just a delivery and work site, or is it for something more substantial? 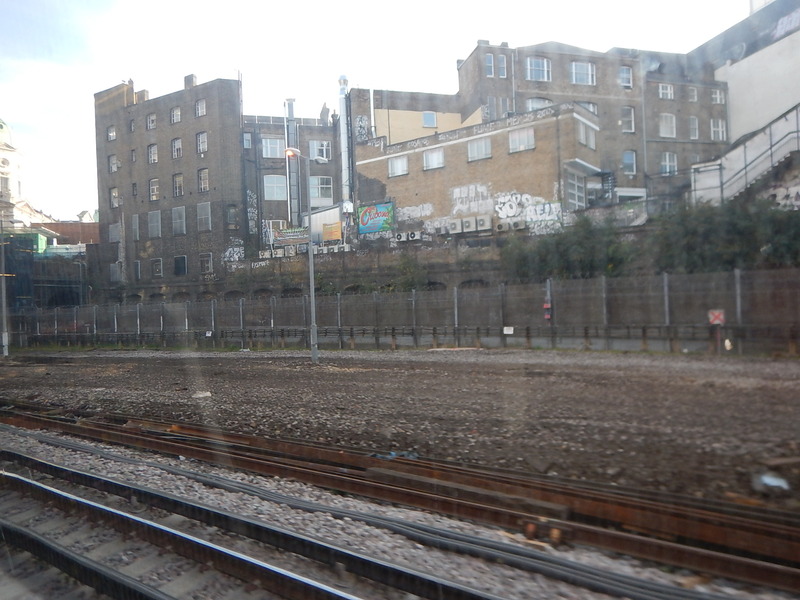 I think it could be the former, as from a Metropolitan Line train, little is visible, as this picture shows. This Google Map shows quite good detail. The hole shown in the top-left corner of the second image is shown on some drawings,labelled as Network Rail Lift Shift. This is being built in West Smithfield. This Google Map shows the area. 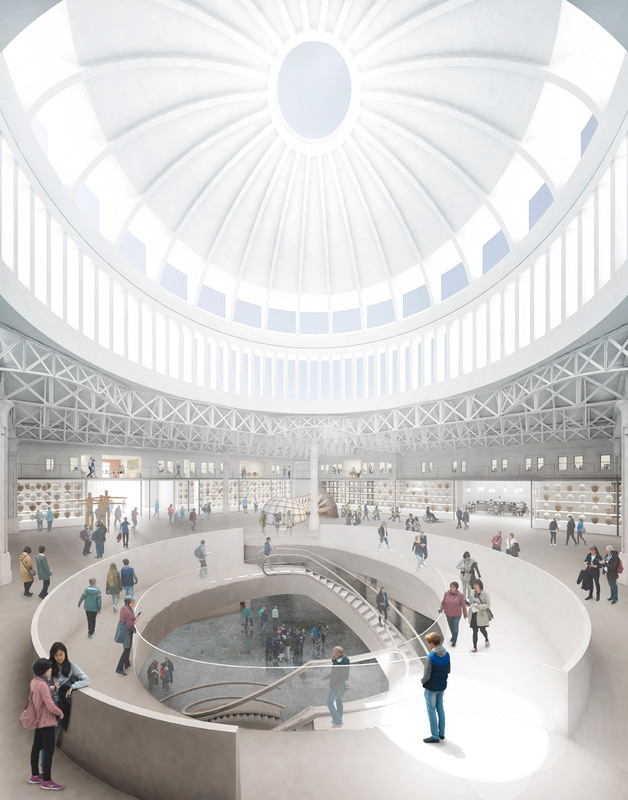 This article in the Guardian is entitled Off to market: Museum of London shows off its new Smithfield site. Read the article and this third paragraph is an ambitious vision. Surely, one of the best cities in the world, needs one of the best museums in the world to explain itself. This map from carto.metro.free.fr shows the railway lines in the area. Snow Hill station would have been just South of the Museum site, but it is known that under the market there are numerous railway lines and sidings, where animals were brought to the market. These must create ideas for the architects. There are more notes on Snow Hill station on this page of the Disused Stations web site. 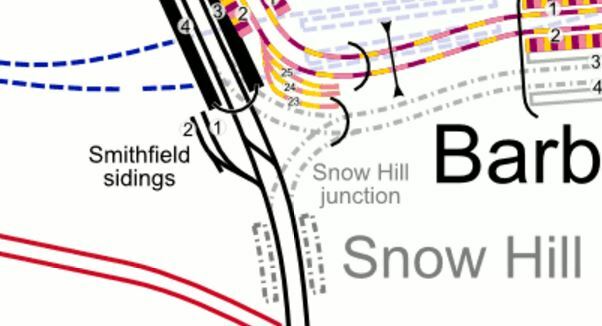 The train line refereed to in the Guardian article previously, is of course Thameslink, running in the Snow Hill Tunnel. Certainly, the future development of the area must provide a decent connection between the Museum and Farringdon station. I don’t think that Snow Hill station will be reopened, but there must be ways to connect the museum to the Thameslink platforms at Farringdon. I started the walk at City Thameslink station, as I wanted to see if the new Class 700 trains, changed voltage smoother than the Class 319 trains. I felt that three decades of progress had improved matters. The Museum site needs work and some good architects. This is one proposal. There is more in this article on the Dezeen web site. Trains from North of London used to go to Moorgate station along the Widened Lines until 2009, when platform lengthening for Thameslink at Farringdon station meant they couldn’t be used. Two platforms at Moorgate are still used in busy times, but two platforms at Moorgate and Barbican stations are unused. The only thing, I can find about the future of these lines is they could be used for storing Metropolitan Line trains. If this is done, then let’s hope there is worthwhile oversite development! Some spaces are quite large as this picture from East of Farringdon station shows. You could store a lot of trains there. 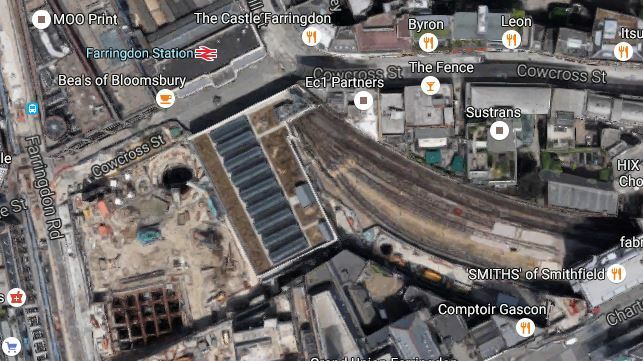 This article on the Network Rail web site is entitled Farringdon Station: London’Newest Transport Hub. From 2018 Farringdon will be the only station where Thameslink, Crossrail and tube services meet. Passengers will have the choice to travel north-south, east-west or around London. With up to 24 trains an hour running in each direction on Thameslink and Crossrail, including tube trains Farringdon will be served by over 140 trains an hour.This will relieve pressure from the Tube and deliver more seats for commuters. Farringdon will provide direct links to three of London’s major airports, Heathrow, Gatwick, and Luton, and to St Pancras International for Eurostar services. I have a feeling some of the spaces and oversite development in the area of Farringdon station, could become visitor-friendly ones, like hotels, cafes and restaurants. Get it right and long-haul passengers into Heathrow and Gatwick, might prefer a night to refresh and enjoy themselves around Farringdon, before travelling out a day or so later. The area will have a lot going for it in a few years. A short walk to the Thames. Direct links to Gatwick, Heathrow and Stansted airports. Direct links to Kings Cross, Liverpool Street, London Bridge, Old Oak Common, Paddington and St. Pancras stations. One-change links to City and Stansted airports and Euston, Marylebone, Victoria and Waterloo stations. If it all goes wrong, you can always visit the Wife Market. As some places like Iceland and Dubai market themselves as a journey break, why can’t London? Or do passengers prefer ice, geysers, sand and anonymous concrete and glass buildings? Not that London doesn’t have a few of the latter! The area round Farringdon station will be a new centre for London. I wonder what my Huguenot grandfather, who was born in 1870, a couple of hundred metres to the North, would have thought?